nshapiro was awarded the Empiricism Barnstar by amysoyka for their work in this research note. nshapiro was awarded the Excessive Enthusiasm Barnstar by amysoyka for their work in this research note. I am in pursuit of an inexpensive means of testing formaldehyde levels down to very low levels. 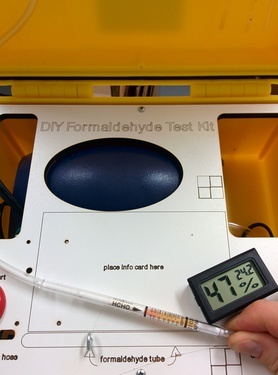 The most common way that formaldehyde is inexpensively measured is by way of a passive sampler ($39 plus shipping both ways) that is placed in a room for 24 hours and then sent to a lab of analysis. This advantages of such a method are that they have no moving parts, are very easy to use, they can detect formaldehyde down to 3 parts per billion, and the results are produced by an accredited lab. The disadvantages are that the samples can become contaminated in during shipment back to the lab, they demand extended sampling time, and rely on black-boxed expertise and expensive instrumentation. Much of the cost is a result of the expensive lab equipment and expert analysis. Fifty or so dollars (including shipping) can feel prohibitively expensive for those in precarious financial situations, which are the populations that face the wost exposures due to poor housing conditions. Consequently the interests of environmental justice and open science both point towards a method that avoids the costs and other shortcomings of the send-it-to-the-lab paradigm. 1 Kitagawa 710 Formaldehyde tube (1 box of 20 tubes costs $129 + shipping). 1 VWR FLOW METER ACR 2IN.1-1LPM ($74.62 + shipping). 1 Tetra 77855 Whisper Air Pump, 100-Gallon ($19.22). 2 small segments of ordinary aquarium airline pump (very inexpensive). 2 1/8-27 MPT to airline conversion valves ($4 for two). The first step is to reverse the diaphragm in the pump to convert it to a vacuum. Open up the four Philips head screws on the belly of the pump. Lift up, rotate 180 degrees, and then replace the diaphragm as indicated in the below GIF. Attach a small segment of airline tubing from the pump to the top of the flow meter (which you have equipped with the conversion valves at both openings) and then attach another small section of tubing to the bottom of the flow meter. You will have three points where you can adjust the flow rate (the meter, and both conversion valves). Open all valves to their most open--while still sealed--position. Once you've started the pump, use the large valve on the flow meter to regulate the flow rate down to .3 liters per minute (or 300 ml per minute). Using the heart-shaped scoring stone included with the tubes, score and then crack off both ends of the tube so that airline tubing can snugly attach. Attach the tubing so that the "HCHO ->" arrow is pointing in the direction that air is flowing (ie towards the pump). Set an alarm for 30 minutes (don't just look at the clock and hope you will remember). Place the kit on a level surface at least three feet above the floor and plug the pump in and start your timer. After 30 minutes turn off the pump and inspect the length of stain by eye and take a photo of the tube in medium light with a black background. 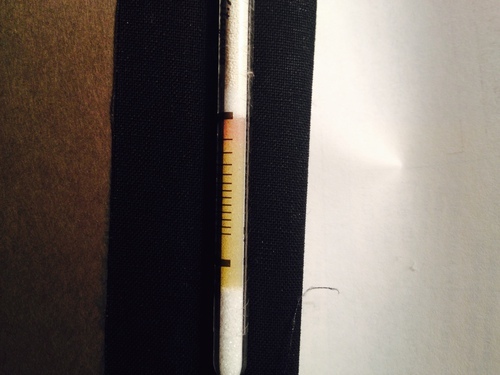 The reagent in the tube will begin with a yellowish waxy color and will discolor to pink to indicate the level. In my preliminary test of a room that had been renovated 20 years ago, in a old somewhat drafty house, I found .01 ppm or 10 ppb. The thermostat was set to 69 degrees F, which corresponds to 20.56 degrees C, which gives us an actual formaldehyde concentration of 9.85 ppb. Which is about average for a US conventional home. This test cost over $230. But over the course of the entire box of 20 tubes the average test price will drop down to $12.10 (+ the shipping costs of all the parts) and as we continue to use the flow meter and pump for many boxes of tube the average cost will continue to drop. This method becomes very cheap if a large number of tests are required as each formaldehyde tube, which is the only one-time-use part of the system, costs $6.45. Setting up a system to share the pump and flow meter will make this method readily affordable and concerned people will be able to take four tests of their home at different times of day (to understand the dramatic oscillation of formaldehyde in a home due to temp and humidity changes) for the same cost as a single formaldehyde badge. Results from this method are immediately available, whereas the results from the badge are delayed by 2-3 days of shipping and 2 days of analysis. This method only requires a short duration of testing and doesn't require external lab analysis (which adds the possibility of contamination during return shipments). The detection limit is 5ppb which is 2 ppb higher than the badge method described above. Both detection detection limits (the lowest concentration that the kit can detect) are below the ATSDR Minimum Response Level for chronic (greater than 1 year) formaldehyde inhalation, which is of 8ppb (.pdf), and therefore seem to be able to document formaldehyde down to a concentration that is not likely to cause any non-cancerous health effects in humans. I would suspect that this level is lower for companion species, but the Canary Database doesn't have any entries for formaldehyde. If you do find elevated levels of formaldehyde, then you could think about remediating you air. We've begun development of our remediation kits here. Longer term solutions include identifying the source(s) and removing them which may be very costly and the sources may be the very structure of the home itself in the form of pressed woods. Obtain many aquarium pumps and access to a high quality digital flow meter to validate each analog flow meter. Testing the decline in pump performance over time across a number of pumps could allow us to predict the pump flow rate depending on duration of use and allow us to not need a flow meter, which would decrease the cost of each kit. Figure out the best means of demonstrating the length of stain in a photograph (background color, lighting and smart phone camera). Maybe an index card with time, place, temperature data fields on it so all the meta data would be in the image? Develop a Fahrenheit temperature correction table. Or just encourage the thermostat to be set to 68 degrees F so that no temperature corrections need to be done. I propped my first test tube up on the meter-to-pump airline so as to sample the air above and not the air directly on the sampling surface, but because of vibrations the tube moved around a lot and needed to be monitored and rearranged a couple times. 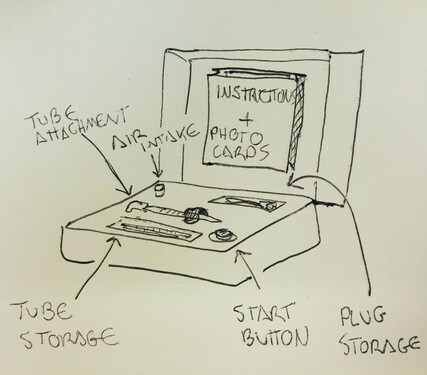 How can we develop a simple stand so that the tube can be securely vertical so as to not be drawing air across a potentially formaldehyde emitting surface? This could be as simple as a rubber band to old the tube in place. We will be further workshopping this kit and performing multiple tests this Friday and Saturday in Boone, NC. Further refinements and observations will be posted soon. I have been studying residential formaldehyde exposure for the past five years and am the lead researcher of the Public Lab Where We Breathe project that focuses on domestic chemical contamination and mitigation. I did this Help out by offering feedback! 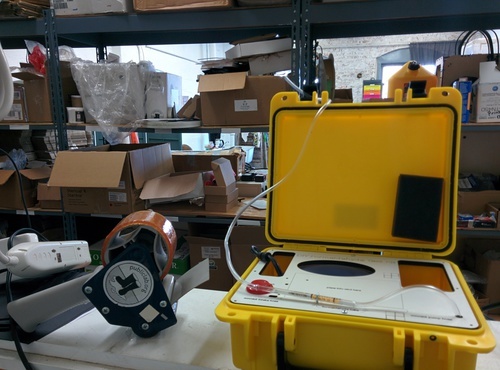 Browse other activities for "open-air"
The commercial air flow meters are easy to use and come with NIST traceable certificates but you can make your own air flow meter for lab use that rivals the $1k meter performance. There are many variations to this method but essentially you need a graduated cylinder column with a hose barb fitting. Attach the air intake line to the column then time how long it takes a soap bubble to travel a portion of the column. Calculate the flow rate as volume / time. You may want to add a water knock out to prevent any soapy water from entering the tube and fowling anything upstream. For a knock out you just need any air tight container (e.g. mason jar, tupperware) with a couple hose barbs. You also need to size your column appropriately for your flow rates. If measuring 0.1 to 1.0 lpm, I would consider using a 500 ml column. If the bubble travels 400 ml in the column then it would take 240 to 24 seconds at 0.1 and 1.0 lpm respectively. I would check the flow of the system at at least four points and then make a correction curve if necessary--and it will probably be necessary. That sounds like a great idea. The flow meter remains the most expensive component so reducing this cost is clutch. This sounds like something that we should experiment with at the barnraising in a couple week's time. Thanks very much for the suggestion! I think so. Those tubes require one pump on the Draeger Tube proprietary pump. So if one were to rent their proprietary pump for a single day and attach a flow meter to it (preferably one of the higher end ones with a large monitoring range), then you see what the flow rate through the tube is and that could likely be replicated by an inexpensive pump-turned-vacuum. Yesterday I was at APHA and heard mention of H2S biomonitoring in urine (but I can't quite remember the metabolite that would be assayed) . Would be interesting if pH like test strips could be made for H2S biomonitoring. I just bought the air pump components and a graduated cylinder to try and compare @davidmack's cheapo air meter... can't wait. I'm going to try using this to control airflow to a shinyei dust sensor. Hi, Nick - I'm working on some sketches of the kit; do you have any photos of the entire thing, just a bit more zoomed out? Thanks! On reversing the aquarium pump: Be sure and reverse both diaphragms! Oh, I was making assumptions. I had not seen a pump that was set up to have 2 different attach points. So never mind about my comment! following up on our discussion about trying to calibrate the pump without the flow meter-- could we calibrate the pump at our office, and then have it run on a timer? that would probably make the test easier-- we could do automatic shutoff. I think that makes the process even easier. I think the best interface is an analog dial. I have two darkroom timers here, and vintage timers are 10-40 bucks on ebay, but new timers are too expensive. Dunno if we want to deal with the headache of sourcing a bunch of different things. I bet our calibration could last for at least 5 tests. having people pass them along to the next person (for a set batch) as opposed to sending them back and forth would save a ton of money on postage and personal shipping time. when we use the mini buck to calibrate we can see how many tests each calibration can hold. setting a time/test duration is a pretty standard. The vintage timers are probably far too massive. I'm not as worried about tampering as I am about good faith forgetfulness-- I don't always hear the washing machine buzz in my house-- I'm glad when things turn themselves off. Gotcha. In my testing in 2011 i did some of the test and mailed test kits to those i couldn't meet in person. altho it wasn't statistically significant the results of the self test were lower, probably meaning that they didn't prepare their homes (close windows and door for 24 hours prior to testing) as thoroughly as they did when someone was showing up or they turned it off too early. So i'm not so worried personally with forgetting the test is happening (leaving it on too long would result in a higher result which didn't appear to be the case), i say "tampering" because our case will be stronger if we can claim it to have an un-mess-with-able sampling time. thinking speculatively, could we have a system that you call when you start the test and it calls that number back after the allotted time and then they confirm into a voicemail that the test has been stopped? 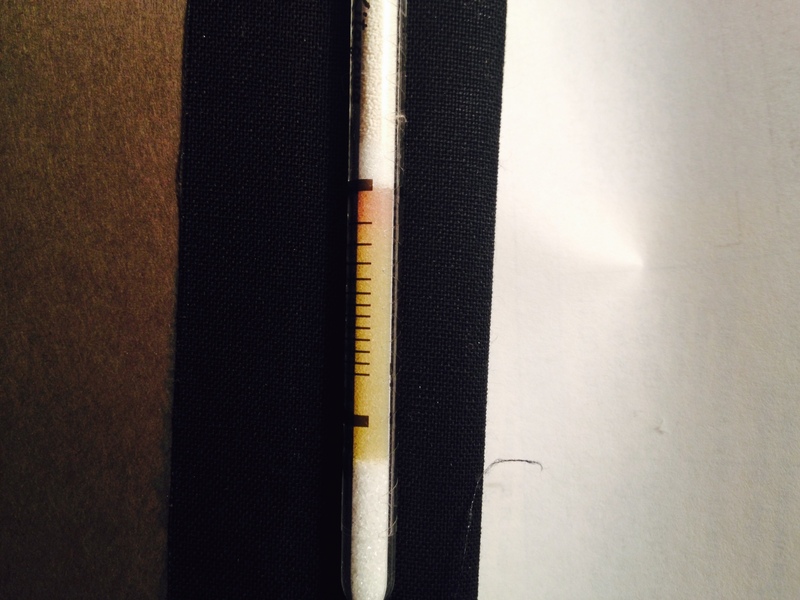 "I have been thinking/researching a cheap flow meter. I sent a couple of e-mails to vendors that advertise seemingly appropriate meters for under $30 and have not received a reply yet. I have also been thinking on how to construct a variable volume flow meter with the least amount of tools and cheaply. Calibration: I don't remember who and can't find the e-mail but someone suggested the bubble in the graduated cylinder method. That seems to me to be the way to go. Use this to calibrate the homemade flow meter. The cheapest way to go here is probably a disposable plastic pipette. I have not priced or sourced any yet but I can't believe that they would be very expensive. They come in lots of sizes so some appropriate size should be easy to obtain. I got a free sample of several sizes at the Pittcon conference in March so I should be able to determine an appropriate size fairly easily. Flow adjustment: A simple screw clamp or similar device on an aquarium hose should be easy to construct or find. Flow meter: The most accurate measurement at 0.3 lpm is most likely the variable volume flow meter or rotometer. The problem with constructing such a device is how to make the conical bore. Drawing a melted glass tube is probably not easy enough to accomplish. I attempted a similar process with placing aquarium tube in boiling water and stretching it. That may be a viable solution but more research needs to be done but I don't have much confidence in the process. My neighbor and I were talking about this and we came up with an idea to make a stepped bore. Since we only want one flow rate (perhaps 2 if measuring a different chemical also) then when obtaining the correct flow rate the ball would be no lower than one step in the bore and no higher than the other step in the bore. To construct this would require a standard ball, a set of drills, and a hunk of clear plastic. Drills may not be accurate enough so I would expect reamers would work in that case. Determining the correct size of the holes and ball can perhaps be calculated to reduce the amount of experimentation required. I have not researched the formulas involved but expect that they are readily available." Thanks Nate for posting my thoughts. I wanted to comment on Mathew's idea of calibrating the pump before shipment. I assume what is meant is that a fixed restriction is attached to the pump to get the proper flow rate for the formaldehyde tube. The problem with this idea appears to be in preparing the measuring tube. When you score and break both ends of the tube the resulting two orifices will be different sizes each time this procedure is done. They will be scored on a different point on the tapered glass seal. Thus the flow restrictions from the tube will vary. I do not know if it will add sufficient enough variation though. Perhaps a way around this is some fixture to use so that a consistent diameter is scored thus resulting in a standard flow thru the tube. Another approach to this problem would be essentially what Drager does. We could construct a manual vacuum pump. It would essentially be like a bicycle pump but with the valves reversed and a spring to return the plunger. We know the Kitagawa 710 Formaldehyde tube requires 300ml/min×30min which is a volume of 9,000ml or 9 liters. If the vacuum pump moves 1 liter per stroke then it takes 9 strokes over 30 minutes. The vacuum pump could have an orifice so the spring would slowly push the plunger out. Clear indications that the plunger has been fully pressed and fully returned would be needed. A mechanical counter could be used to count the strokes or a place on the DIY Formaldehyde Test Photo Card could be used to make tick counts. Some big advantages are that both the electrical pump and the flow meter are not needed. @danbeavers hmm... the variability in the break and its effect on flow could be quantified with a more accurate flow meter. I wonder how variable it would be-- they provide that little bauble of glass on the end to try to make it break in the same place. @davidmack suggested the graduated cylinder method in the first comment of this note. @nshapiro I wouldn't feel comfortable with a stepped, DIY bore to an air meter- I'd seriously doubt its accuracy. On making the system tamper-proof- we could use a "time delay relay" which is a standard piece of automation/security/HVAC equipment ($8-25). We could then set the timer before the pump leaves our office, and the user would just hit a push button to start the process. Time delay relays generally reset the counter with every button press though-- so we'd probably want to get a two-channel relay and use the second relay for turning off the button as soon as the timer starts EDIT-- a quick search reveals there are also "self-locking" time-delay relays. Someone would have to take the whole monitor apart to reset the pump timing. Mathew: Why would you doubt the accuracy of a stepped bore? A reamer will provide very accurate hole size and ball bearings have very accurate dimensions. The combination of the two make a very accurate orifice. But I think I like the manual volumetric vacuum pump best of all. Also, I wonder if there is much variation in the flow restriction from one packing of chemicals in the tube to the next. +1 to the time relay delay it could be adhered to the belly of the pump. Digging the flow meter debate! @Danbeavers If you ream it you're right-- I was thinking about just a drill hole and that note. Vibrations on either a cheap drill or a poorly secured work piece will introduce significant wobble in drill holes. I really like the idea of a vacuum pump, but even with sensors watching the pump stroke, someone could still cheat or just miss on the process. I'd like any new hardware we introduce to make the process more fool proof. The air intake is in one end of the tube. 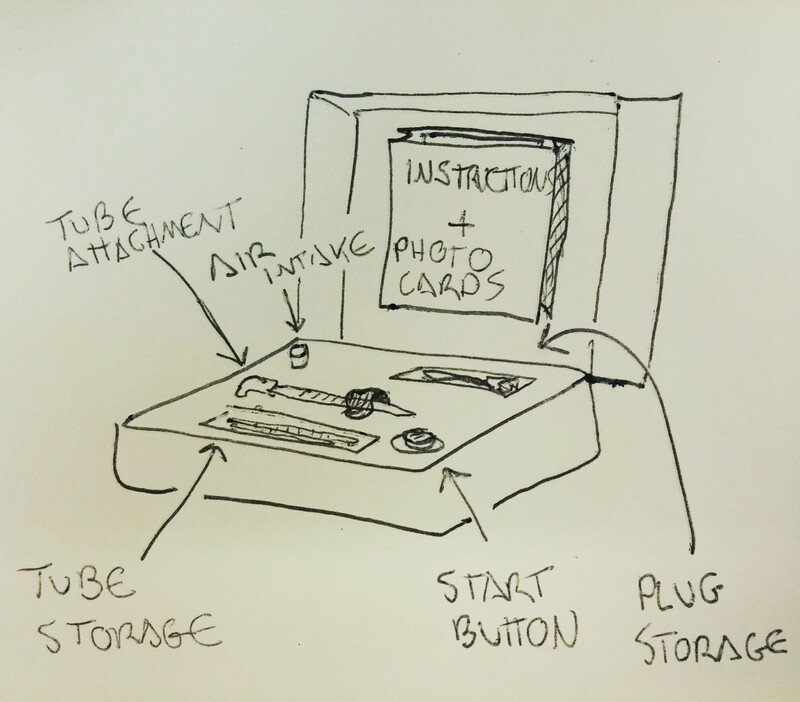 so we could have one less inlet to cut in the top panel and we could have it so that the tube can flip up vertically so that it can sample without pulling air over the foam of the packing material or the lid that may be off gassing formaldehyde. Mathew: Perhaps I am not understanding some objectives here. Is the idea to be able to use one of our measurements in court? I doubt that that is the purpose. Is it then more about concerns for PL's reputation or is it negligent operators? Accomplishing a "fool" proof system sounds rather expensive to me. Probably the objective is reasonably compromising between cost and automation. This http://www.komyokk.co.jp/kweb/pbtop.do?pbno=1002&je=1 is more like what I am thinking would be best. Has anyone received a quote on this? Would it work with the formaldehyde tube? Answering my own question: "The KITAGAWA air sampling pump reproducibly draws 100cc of sample air" So that would be 90 pump cycles thus makiing it impractical. If we can accurately design a similar pump with a liter volume then it becomes 9 strokes. 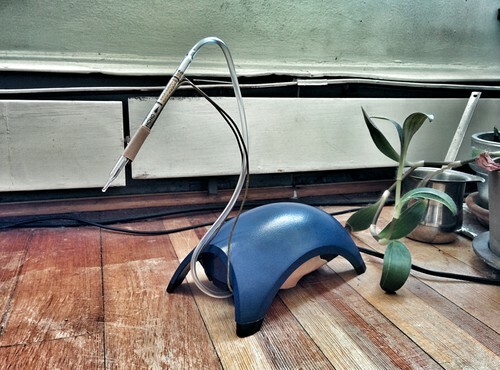 i actually have three of those pumps on my desk. they have a counter up to 10 and a thermal ring (that doesn't appear to work) for temp and a tube tip breaker (a glass tip is stuck in one of them). I think they work best at high levels. The tubes that go with those pumps have a higher (10x higher than our tubes). I think the larger volumes of air work better for lower levels. I totally agree that we are looking at a balance of cost an automation. we also want to make sure people are getting the most robust data that we can give them and to make every test as similar to the next test as possible. how to we demonstrate trust in the capacity of non-scientists that the chain of custody system so thoroughly disregards while also encouraging consistency and validity? we could have some kits with the auto shut off and some with just a timer and see how their levels compare? I think people will be pretty good at unplugging their kit right on time, its something that you don't do everyday (like cooking or running the dishwasher) so I think people are pretty attentive to it. We can also get very bold and underline-y in the instructions about the timing. @danbeavers I am interested in making our data usable in court, but I'm also trying to be budget-sensitive. we're looking to mail these around from house to house, and over the long-term our biggest costs will be related to logistics, not the upfront costs of hardware. The automation option I'm looking at adds probably ~20 bucks to the finished cost. A solid case will add another $30. While optional, these things potentially make packing, shipping, and operations more seamless. While a solid case and automation will add about a $50 to the equipment, if it prevents 10 or so mistakes over the pump's lifetime we'll have saved money: Every time someone screws up and decides to either re-run a test with a tube reserved for the next user, or holds onto the pump waiting to re-run an test is going to result in a bunch of logistical rejiggering over here. It is also easy for someone to miss-pack a box and break something, or disconnect stuff that will need to be plugged in, potentially introducing more logistical issues. I'm not thinking about negligence so much as everyday carelessness-- no matter what we do even the best of users are going to screw up sooner or later and give us a headache, but we can design to minimize the chances of that happening. If it makes our data look more legally admissible, all the better. Hey @mathew, do you think the goose neck thing I put together is worth pursuing, or is compatible with the box idea you posted? Just want to know how to proceed on visual design on the video I'm working on. I think for the neck unit-- we need to have a flow meter in the flow. That is a perfect configuration to use in the buy your own kit, whereas we're trying to design the boxed kit as a thing we'd ship around in a library. very different design considerations between those two. OK, cool. Are there options for the flow meter Nick's used above, in terms of size, etc? It has to be upright, right? it has to be upright, yes. what other options are you thinking of? Just size, really. I have to order one of these too so I can use it in the video I'm working on. Is that supposed to be 1-10 LPM? Thanks! .1-1 is correct. I have three right now. i can send you one. but you would need to get the valves. my supplier just ran out. Oh I see! I had read it as 2IN. My brains a little slow right now, sorry. I need to be watered. I have small plastic valves, had to order 5. I'll send one out. Actually that'd be super great. If they'd arrive before next Thursday, Nick and Mathew, could you send them to Propeller? Mathew: The "super simple" flow meter you linked to is what DavidMack was describing in the first post comment. That is real good to calibrate a meter or measure a small volume and not so good to control a flow rate by. Luc L. and I did some brainstorming this evening at the Picayune Make meeting. We went over all the ideas I had and he came up with some more. The least expensive and practical we ended up with was a manometer attached to two tees with a needle valve (or similar) between the two tees. You essentially end up with this configuration: https://en.wikipedia.org/wiki/Flow_measurement#Orifice_plate The way you operate it is to place some colored water in the manometer (U shaped tube) and move the measuring stick so the 0 is on the meniscus. After you prepare and attach the formaldehyde tube you turn on the vacuum pump and adjust the valve so the meniscus is at the previously calibrated 0.3 lpm value. When you are done with the measurement you disconnect the manometer and plug both ends so that the water does not leak in the shipping container. Perhaps [@Stevie](/profile/Stevie) could order them. 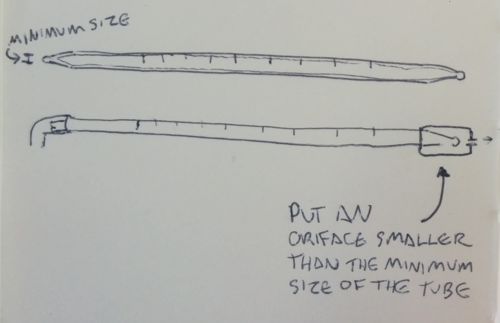 @Danbeavers what if we put a standardized, small orifice on the broken end of the glass tube that is always smaller than a hole broken into the tube-- then we'd have a standardized airflow (provided the flow through tubes is consistent. Here is a photo of the tip breaker that is on some of the analog pumps. We could also pre-score them in a standardized way to create consistent openings. Mathew: That sounds like a mechanical engineer (which I am not) question. I SUSPECT that it will be the sum of the restrictions because of the low pressure we need. Nick: I am also not a glass expert. My thinking is that the breaking of glass should happen soon after scoring. The reason is that glass heals. Aged scores would probably result in breaks that would be either hard to accomplish or not consistent in shape. But again, I am not a glass expert. Assuming you could pull a reasonably good vacuum on the orifice, you could get a fairly constant flow. What you would need to do is ensure the flow through the orifice is sonic, or "choked" as it's often called. The rule of thumb for choked flow is that the absolute pressure of the inlet is 2 times that of the outlet. Since atmospheric pressure is about 14.7 psia, the vacuum pump would only need to pull the outlet side down below 7 psia, which I don't think would be much of a task at .3 lpm. The advantage of using choked flow is that once the orifice is flowing sonic velocity, the downstream side of the process no longer affects the upstream side. In other words, you could go from a perfect vacuum to a marginal one and as long as the pressure is below 7 psia, it won't change the flow rate. The bad news from a practical standpoint is that the required orifice size for .3 lpm at 14.7 psia is down below .01" according to my calculations (using two different tools), which is about as small a hole as you can drill. You could probably find some kind of laser-cut orifice smaller than that. As far as the upstream flow resistance, you would have to have some extreme restrictions to give you much effect at .3 lpm - the hose ends shape would be negligible. If extreme accuracy is not an issue and the orifice size is obtainable, I think the vacuum method is reasonable. In that case, you'd also want to use some kind of filter with a smaller rating than the orifice size to preclude clogging such a small hole, which would give you a false negative reading due to lack of flow. Verify that the humidity is above ?? and below ?? Nam sit amet purus sit amet eros blandit ultrices. Fusce viverra odio quis est elementum convallis. 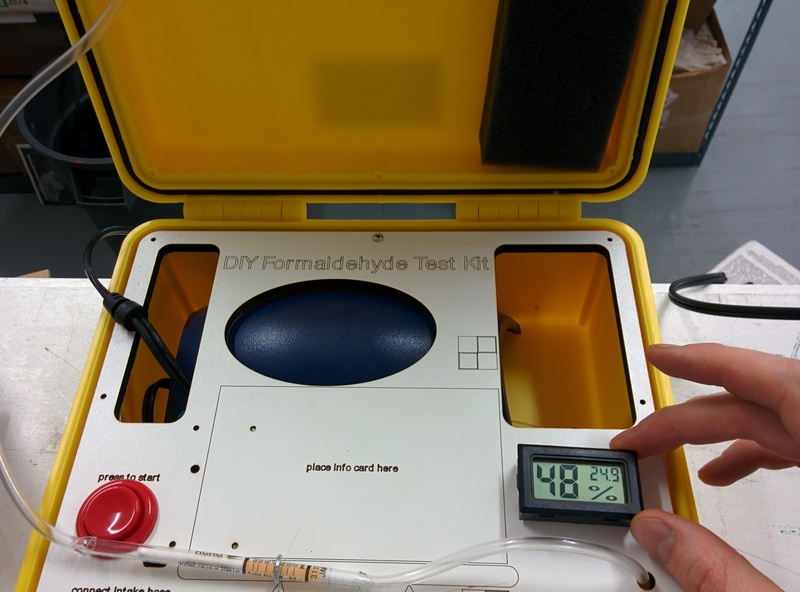 Our portland office has .026ppm (26ppb) of formaldehyde when measured over by our packing and shipping area. That's over 3 times the chronic danger level. fun! I ran a formaldehyde test over by our shipping station, now that the flow on our lending kit is calibrated. We got 26ppb, or about 3.5x the chronic exposure safety level. Fun! Just repeated this test today at 26 degrees, and temperature corrected we got 25ppb. So good news: consistency. Bad news: consistently hazardous conditions in our office! It appears you need some more ventilation or perhaps start using the remediation process. http://publiclab.org/notes/nshapiro/10-20-2014/diy-indoor-air-quality-remediation It would be interesting to see how much reduction you can get. Any thoughts on using a smaller pump? 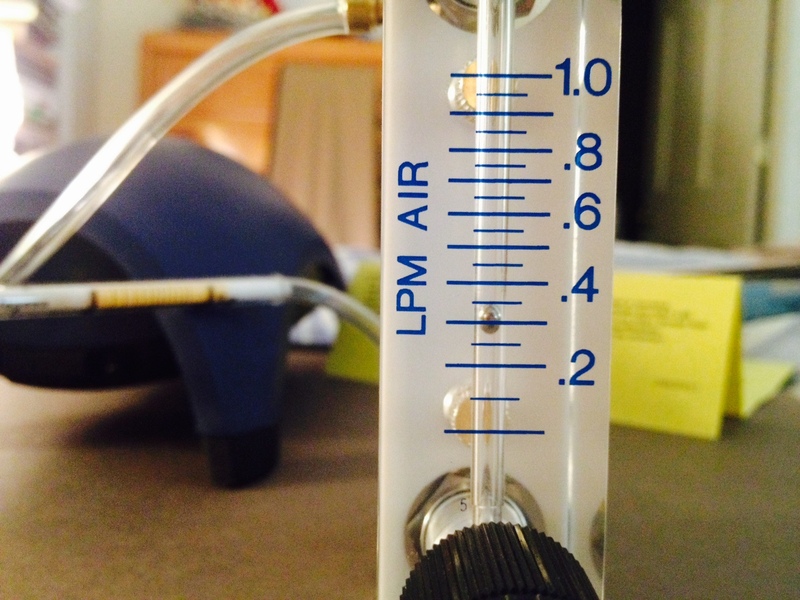 If you're only trying to draw 0.3 SLPM, there are a couple of pumps (see the attached datasheet and catalog) used for a similar application that may be able to draw enough air through the draeger tube. There are probably more out there like these as well. I'm unsure of the cost of these, but I can request a quote and find out. If they perform as well as the larger aquarium pumps, it may be good for reducing the overall footprint of the device (the smallest for air is the SP 200 EC-LC, at 33 x 25 x 16 mm) and significantly reducing shipping costs. A handheld formaldehyde monitor would be really cool. @kkoerner Hi Karl! Great find! It would be fantastic if you could request a quote on these. We are planning on have a lending library of these tools that would be shipped around between people needing formaldehyde testing so over time the shipping costs will really add up and weight saving would save the community a good amount of money. @mathew might also be interested in Karl's pumps as he has really taken the lead on the lending kits. Great writeup, Luke! cool work. LukeS good to know, thanks for testing out those pumps and posting your results!